since I had another batch fresh out of hs - batch 2009! and my first batch - who are fresh out of college! and most are already working! with Tinsel! Keep in Touch! so what's your Michael Jackson connection? this made me more aware that this guy really made such an impact in the music industry...and he has such numerousssss! and I mean lots of hits! kainis naman dahil kasi kay Michael Jackson...lumagpas tuloy tayo! "Philippines' Queen of Bossa Nova"
Tall, tan, young, and lovely were some of the words that Antônio Carlos Jobim and Vinicius de Moraes used to describe the illustrious Girl from Ipanema; and in 2006, the Philippines was blessed with the opportunity to witness her beauty–in the fitting form of Sitti. While the Techy Romantics are clearly based on the magic of electronica, there isn’t a hint of contrivance here. Everything sounds natural, everything flows freely. There is no strategy, there is no plan. Beats begin breathing, guitars come a-stirring, vocals creep in, and then the songs, they just come alive. And it’s not anarchy, it’s not chaos, because there is a lovely order in things. There’s just this powerful surge of energy that nobody can resist. The Camerawalls rises from the ashes of Orange & Lemons – which disbanded in September 2007 after skyrocketing to popularity on the merit of three distinct albums that found favor in a discriminating musical audience. The music of The Camerawalls creates ripples of nostalgia and pop – manifesting an eclectic array of influences ranging from ‘60s-era Beatles, to The Jam, to the ‘80s guitar pop sound of The Smiths, XTC, Terry Hall, The Stone Roses, and The Pale Fountains, to name a few. Juan Pablo Dream started as a bossa nova band in early 2004 and later on added horn section, and ended up as a groovy soul band. The band’s debut album “Soul Up” is composed of eleven original tracks including a bossa nova rendition of their single Nice Place. JPD also contributed a song to the compilation Hopia, Mani, Popcorn 2 with their version of “Bato Sa Buhangin”, an original from the 70’s band Cinderella. To create a Motown flavor, they added two new female members to compliment the band’s musicality. For sure, anybody can dance to the groove that this fabulous soul band has to offer. The band’s influences include Ray Charles, The Who, Otis Redding, Aretha Franklin, and many more. Layag is an upcoming fusion soul group, whose music merges poetic lyrics, soulful melodies and catchy rhythms. The group is composed of Gayle Dizon's powerful vocals and a roster of highly creative musicians who come from different musical backgrounds, each contributing to the band's unique, yet distinctly Filipino sound. Tickets are at Php 300 with one free drink! if we hooked up in Alabang for it! Mind you! I was listening to the chairperson! i know how to make a gif image wohoo! goodness! my patience paid off haha! we were having fun and tried to capture jump shots! What took you so long to let me know? which is the better background music? So which do you think is the better background music? Weeknight Memoir or Uh-Oh...both by Taken by Cars. T here is a story about a king who did not have any children to succeed him. He called his closest advisors and gave them each a seed to plant, telling them, "Whoever best cultivates the tree within these seeds shall reign over my kingdom after me." Years passed and time came for him to step down. He called his advisors to the royal garden to review their work. All of the trees were gloriously bountiful and colorful except one. It had not even broken ground. The king approached the gardener of the unborn tree and asked him what happened. "Your highness, I did my best. I watered the seed daily, spoke to it with love, used the best nutrients, and made sure it enjoyed hours of direct sunlight. I'm sorry to have disappointed you, but not even a root sprouted." "My son," the king responded, "you shall be the next king." The advisors looked at the king in shock. The king continued. "You see, instead of giving you each a seed, I gave you each a small, smooth pebble. 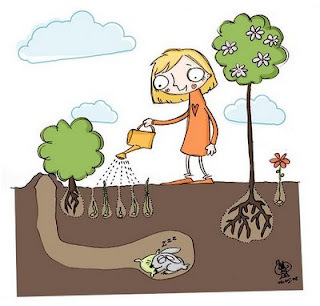 Most of you couldn't bear the thought of not succeeding, of not being the best, so you planted a 'real' seed. Only one of you had the integrity and honesty to do your best with what you were given. That man will be your next king." This story clearly illustrates what being a teacher is all about — and we are all teachers. It's not about the bells and whistles. It's not about good looks or fancy words. It's about honesty, integrity, and dedication. It's the willingness to make the best of what you've been given, even if it's not what fits the mold. It sometimes means working long and hard hours at a relationship, with not so much as a thank you. back in the office, I mentioned this incident to my officemate and why I did that...coz he was the same kid who I remembered was crying during his first day in Preschool! Goodness! That was preschool...and now he's 1st year HS!!! Uy! kamusta na kayo? teka! graduate na kayo? working na ba kayo? how are the board exams? And honestly...I enjoyed myself really... despite the jitters - first time for both of us to be that nervous because of emceeing haha - and even ended up talking about Sheila's wedding and her giving me tips on how she wants it to turn out...so now Sheila assumes I'd be her coordinator for that! Goodness! Congratulations to Paul & Emma! But well I tried and celebrated it just the same...and was utterly surprised to discover that I enjoyed my birthday! Had a late gimmick the night before and yet I was still up and about early the next day for our Teambuilding Activity. We were headed of too Talisay, Batangas, that's where our school president has their family rest house... and she had it made in a way that it can also accommodate seminars and such so it had its own pavillon for activities and small huts with rooms for guests. Learned alot about our little secrets, quirks, attitudes, habits and perceptions of each other and of our group as a whole.